The lymph system consists of lymph nodes, lymph vessels, and organs. The primary jobs of the lymphatic system are to isolate and fight infections, and to absorb excess fluid, fat and debris from our bodies. As these materials build up in the lymph system, it may become congested or blocked. Because the lymph system cleanses our entire body, symptoms of a blocked system can manifest in many ways from frequent cold and infections to joint pain. 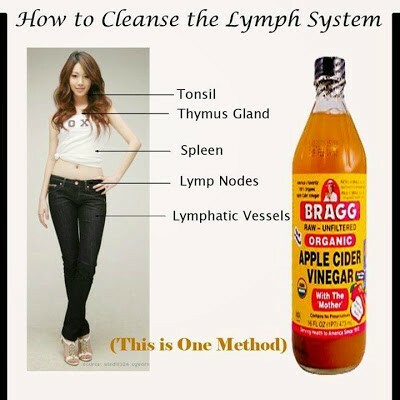 Follow healthy nutritional and lifestyle guidelines to cleanse and rejuvenate your lymph system. A healthy diet produces less waste for your lymph system to clean up, reducing your chances of congestion. •Avoid processed foods that are high in salt, sugar and preservatives. •Eliminate simple sugars and carbohydrates. Replace with raw Honey, complex carbohydrates and fruit. •Identify any food allergies you may have and avoid eating those foods. Your body needs to be well hydrated to keep your lymph system operating properly. Practice deep breathing from your diaphragm and through your nose to keep your lymph fluids moving. Learn proper breathing techniques to get the proper amount of oxygen throughout your body. Tight clothing restricts your lymph and contributes to blockage. For the same reason, women should avoid under-wire bras and try to wear no bra for at least 12 hours each day. Deal with stress, depression and other emotional issues. Just like a congested lymph system can lead to emotional problems, so can the reverse occur. Sometimes when we are stuck in stress or other emotional issues, these feelings manifest in physical problems. •Acupuncture has been found to do wonders for keeping our lymph system flowing. •Regular treatment from a massage therapist who is familiar with lymph drainage massage is a great way to keep your entire body healthy and your lymph system running smoothly. Do a detox and colon cleanse treatment following manufacturer instructions. •Choose one that is supported by liver enzymes to ease the burden on your liver and kidneys, and to decrease the pressure they place on your spleen. •The appearance of cellulite is often a sign of a congested lymph system. Massage the areas of your body where the cellulite exists, as well as the lymph nodes in your groin to help improve the condition. •Self massage can also be beneficial to cleanse your lymph system, especially if done around your abdomen and breasts. I take 1 teaspoon of ACV in 8 ounces of water every morning. •Chop a small onion and a few cloves of garlic. Put them in a jar and fill the jar with honey. Let it sit for a couple of weeks. You can use this honey which becomes kind of thin and syrupy just to eat as is, with or without straining. •Or add 2/3 cup of raw apple cider vinegar to 1/3 cup of the honey mixture that has been strained. Dilute 1 Tablespoon of the mixture in juice or water and drink it every morning.